Meghan Markle isn’t a bona fide member of the royal family yet and she’s already the most famous person alive. Okay, that’s dramatic, but you show us another person who can sell out a wool coat in seconds, okay? (Kate Middleton, sure, but who else?) Markle was met with throngs of cheering fans during a royal appearance at radio station Reprezent, and we don’t think she was quite ready for the fanfare. She and Prince Harry appeared at the youth-run radio station in London on Tuesday, January 9th, and when Markle turned to face the crowd, the royal-watchers erupted in cheers. 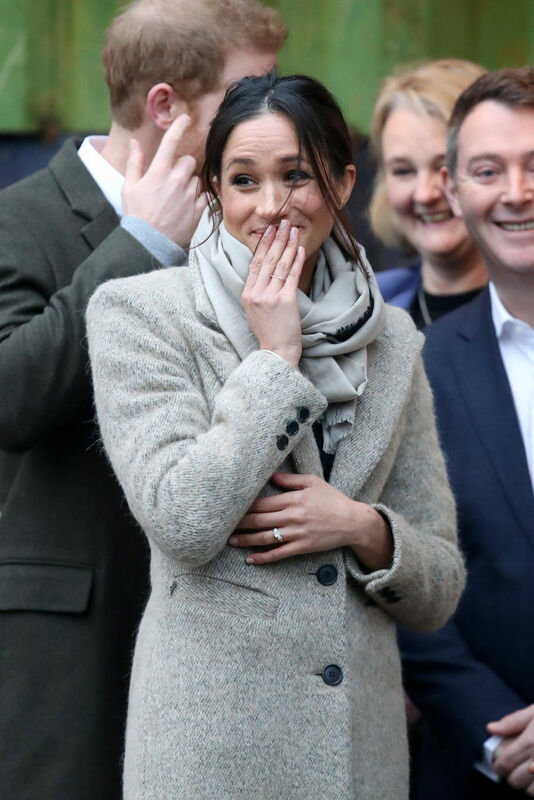 Prince Harry gestured to the crowds and seemed rather unfazed by it all, while Markle had a very “oh wow” moment, and dare we say, she giggled. It was all very cute. Also, this couple is outerwear goals af. In case you covet the wool coat Smythe coat Markle is wearing, sorry, but it’s already sold out. This marks Markle and Harry’s second official royal outing, and we assume there will be many more to come. Even though the couple isn’t set to wed until May 2018, they seem to have hit the ground running when it comes to appearances and charitable events. Markle’s recent appearances as a public servant might explain why she’s deleted her social media accounts. As of today, Markle is no longer on social media. She hadn’t posted on social in months anyway, but we wondered if she and Harry might be the first royal couple to share on social media. Perhaps her newly public lifestyle has created the need to embrace privacy wherever she can get it.